Dollar Store Easter Craft: Clothespin Bunny ! If it is Easter let there be bunnies and if it is Easter let the Bunny crafts begin! 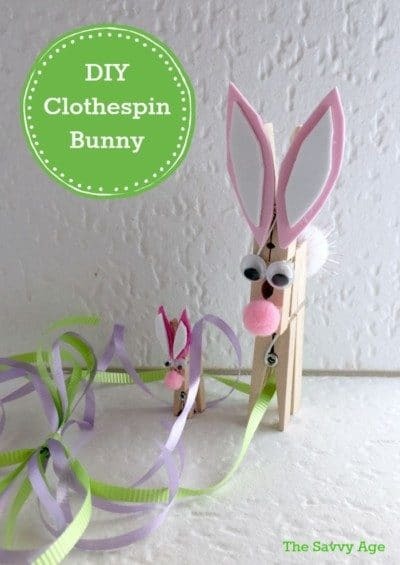 Make the Clothespin Bunny in two sizes to add a little homemade fun to your Easter basket this year. As usual your craft stash and a visit to the Dollar Store will make this an affordable homemade Easter craft. Clothespin Or Wooden Clip For Crafts? Clothespins and wooden clips are interchangeable and depends upon the manufacturer. The best place to find a traditional clothespin is online or at a big box hardware store. They are very inexpensive, but sometimes difficult to find with the decreased use of clothes lines. The mini clothespins are always available at my dollar store in the craft aisle! The clothespin bunny was inspired by a reindeer clothespin made for Christmas. Reindeers? Bunnies? Easter Rabbits? Seemed like they were in the same wheelhouse in a crafty way. The clothespin bunny assembled the exact same way at the Reindeer Bunny with the exception of the ears and tail. Assemble the body of the bunny, learn how here. Cut out the white ear and inside pink ear from foam paper, a set of two. Glue the interior pink ear on the white ear, two times. Place the ears in a V on the face of the bunny. Glue. Now glue the pom pom nose. By gluing the ears and nose first this will give you the placement for the googly eyes. Eyeball the area to place the googly eyes and glue. If the face resembles a bunny then success! If the face needs assistance, no worries, simply remove and re glue the ears, eyes or nose. Add a larger pom pom to make the cotton tail on the back. The placement of the ears, eyes and nose on the bunny may seem the bunny features should be exact. Actually I had more success just free styling the placement. The freestyle method is quicker and you will absolutely be able to determine by the bunny face if the placement is accurate. Bunny face = success! Does not resemble a bunny = try again! The Clothespin Bunny does not need to be in the traditional Easter pink and white colors. I used what I had in my craft stash which meant the cotton tail was a glitter pom pom from who knows what project! The mini clothespins come in bright and cheery pastel colors which are perfect for Spring and Easter. This is an Easter craft that older kids can make; however adult supervision may be needed to begin gluing the base of the clothespins. Children of any age or toddlers can help with picking out and gluing the all important bunny tail! The tiny clothespin bunny is better suited as an Easter craft for adults due to the very small bunny face to assemble. A wee bit of crafting patience is needed to glue the googly eyes and bunny nose. My New Favorite Cookie Icing – Easter Cookies!